…Rex Wallace... has just published with Bolchazy-Carducci a long overdue resource for Latin teachers — Res Gestae Divi Augusti. It has the complete text, notes, a historical commentary, vocabulary, and an index of place names and persons. Biography and autobiography are little studied in our classrooms and here is one of the greatest autobiographical works from antiquity, yet few of us ever teach it because of the special knowledge needed to appreciate the work (Roman history, for example, is far from my strong point). Now, with Wallace’s book as an aid, reasonably priced at $12, we can incorporate this important text more easily into our classrooms. Rex Wallace’s entry into the field is superior in several ways to the two editions (Benario and Damon) intended expressly for Latin students. Wallace’s addition to the available student editions of the Res Gestae offers historical and grammatical/syntactic annotation sufficient to the needs of an intermediate-level student and quite comparable to that in Benario and Damon. The lexical assistance, however, is fuller — much fuller — than in any competing work. These features — together with the volume’s excellent introduction, maps, and illustrations — make it the best option in a field of fine choices for classroom use. P.A. Brunt and J.M. Moore’s 1967 edition of the Res Gestae Divi Augusti has sat unchallenged on bookshelves for nearly forty years, and for that reason, if no other, it is refreshing to see W’s slim rival volume. In practice, the two books complement each other: B&M is probably used mainly by Ancient Historians, glancing across from English text to Latin original (or vice versa) and making use of the thorough but dry scholarly notes. W’s book is intended as a ‘reader’ and is excellently equipped for that role: it includes a helpful vocabulary, numbered lines and very full grammatical notes aimed at the relatively inexperienced Latinist, providing a helpful introduction to inscriptional Latin. Historical notes are highly accessible, though there is little cross-referencing with the other sources briefly mentioned in the introduction. The summary and index of names and places are both clear and useful. My first reaction on receiving the volume was surprise (I’d hoped for a glitzy, Zanker-ised face-lift for this ‘queen’ of Latin inscriptions). And what literary merit does this inscription have that it should ‘take up’ precious reading time? Is one really likely to sit down with a class and read 350 lines of dubious statistics illustrated by dingy black and white photographs? Horror of horrors, is there a danger that we might see it set as a Group A ‘Non-Historical Prose Authors’ text? It is no surprise that this volume was created on the other side of the Atlantic: while we squint myopically through the British exam fug, we risk losing sight of the richness of the subject. I would like to read extracts of this volume with a bright GCSE/AS Latin class (and not just as a mine for ‘unseens’) and would warmly recommend it to an AS/A2 Ancient Historian with Latin (or an undergraduate). One of the great strengths of the volume is that it brings together different aspects of the subject — historical, political, archaeological and stylistic (the terseness of the Latin is breathtaking! — ‘senatum ter legi’ (8)). I was rude earlier about the photographs (and the fig. references are missing from the images), but they should bring out the Indiana Jones in any young reader: the clear and well-selected line drawings also indicate that this is a text which needs to be studied in context. And what better way of preparing a new generation to live critically in a world of spin — as W remarks, ‘not only to read the text but also to read between its lines’(p.xv) — than to take lessons from the master? ...It is thus the purpose of this essay to advocate the reading and teaching of Augustus' Res Gestae, and especially to demonstrate its value in the teaching of Latin style at the intermediate level, whether high school or college. Before I go any further, let me discuss practical matters, namely how one is to find a teachable edition of the text. Rex Wallace has recently (2000) produced an excellent, student-friendly edition of the inscription complete with introduction, historical notes, running vocabulary on facing pages, maps, photos, an index of names and places, and a complete vocabulary list. It has everything students need to read the text and is easily available at $14.50 from Bolchazy-Carducci Publishers (www.bolchazy.com). ...Moreover, all these topics are surveyed in language that should not be intimidating to the novice Latinist. The relative clarity and simplicity of Augustus' Latin make it possible, especially with the student-friendly features of Wallace's recent edition, for intermediate students to read the text with relative speed and confidence. And since Res Gestae is indeed "real" Latin, excellent models of Latin grammar and syntax appear throughout and can be used to review fundamental grammatical structures. ...Thus the study of Augustus' Latin style, valuable in and of itself as a means for students to discover why reading real Latin is rewarding, can also be employed as a counterweight to the persuasive intent of this historical text. Deciphering Augustus' intentions is one excellent way to bring students into the evaluation of his achievements, and thus to continue for another generation the now ancient yet still meaningful debate over the rightful historical legacy of the architect of the Roman Empire. 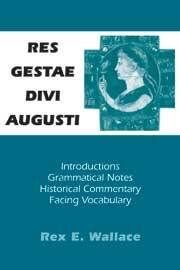 Rex E. Wallace's textbook, Res Gestae Divi Augusti…presents Latin students with an engaging introduction to the corpus of Latin epigraphy. Wallace's work includes a thorough orientation to the history, content, function, and organization of the Res Gestae, along with relevant historical, grammatical, and vocabulary notes on the page facing the text. Not only are vocabulary items put into context, but the complete noun forms and principal verb parts are listed, so that students can quickly grasp the meaning of the Latin without a great deal of page flipping. This volume also contains illustrations and an index of place names and persons; an alphabetical list of all vocabulary items follows the text. Wallace provides an up-to-date bibliography of resources for additional reading that is especially helpful, since instructors may want to give students some background on Augustus' life and refer them to other sources for further historical commentary. This is a thought-provoking text for intermediate college students and advanced high-school students who wish to increase their proficiency in Latin and gain an understanding of one of the key historical documents of the Augustan Age. Scholia Reviews ns 9 (2000) 54. Rex E. Wallace (ed. ), Res Gestae Divi Augusti, as Recorded in the Monumentum Ancyranum and the Monumentum Antiochenum. Wauconda: Bolchazy- Carducci, 2000. Pp. xxii + 80, incl. 4 black-and- white illustrations, 1 line drawing, and 3 maps. ISBN 0-86516-455-X. US$12.00/UKÂ£8.02. James P. Holoka Eastern Michigan University Students and teachers interested in reading The Achievements of the Divine Augustus may now choose from four readily-available, inexpensive paperback editions. The most recent is the book under review; the others are by P. A. Brunt and J. M. Moore, Herbert W. Benario, and Cynthia Damon. [] I will describe these earlier editions and then compare the features of Wallace's. The edition by Brunt and Moore is distinctive in the group because, rather than addressing chiefly the needs of Latin students, it presents the Res Gestae 'for use as an historical source by sixth form pupils and undergraduates who may be studying either history or classics' (p. iii). A helpful introduction discusses the survival of the inscription, the nature of the genre, and date and style of composition. The editors print the text of Victor Ehrenberg and A.H.M. Jones and include an English translation on facing pages. [] Forty-four pages of closely printed commentary address issues of content from historical, economic, social, and legal perspectives. The authors adduce corroborating or clarifying material from relevant literary and epigraphic sources, and cite as well such fundamental modern authorities as Ronald Syme and the Cambridge Ancient History. There is also an appendix on 'Some Roman Constitutional Terms' (pp. 82-84), a 'Chronological Table' of events alluded to or in the immediate background of the Res Gestae (pp. 85-87), and a brief index of main topics and persons touched upon in the introduction and commentary. This edition is a model of concision and provides in a handy format a wealth of basic information for both undergraduates and more advanced scholars interested in the history of the Augustan era. Benario's revision and enlargement of Rogers et al. also prints the Ehrenberg-Jones text. [] His two- page introduction sketches what is known of Augustus's (mostly lost) literary productions and describes the subject matter and survival of the Res Gestae. The following commentary succinctly explains terms, specifies time frames and chronology, identifies persons, events, etc. A much smaller proportion of the commentary offers help with Latin grammar and syntax. A 'Chronological Table' similar to that in Brunt-Moore is keyed to sections of the Res Gestae. Also appended are five genealogical tables of royal families: Armenian, Median, Cappadocian-Armenian, Parthian, and 'Part of the Imperial Family'. A complete vocabulary concludes the volume. Enhancements include seventeen black-and-white photographs and 100 brief passages, principally from letters and sayings of Augustus, as reported in Suetonius, Macrobius, and others; these are also equipped with full commentary. Damon's edition, like other installments in the Bryn Mawr Commentaries series, is pitched to intermediate- level language students. A two-page introduction characterizes the inscription and its publicity value for the emperor. The text adopted is that of Ehrenberg-Jones 'lightly revised in spelling and punctuation'. The commentary is generous. Although, as compared with Benario and Brunt-Moore, more of the notes are devoted to grammatical matters, historical information is quite adequate. Damon also prints a corrected version of the Greek text of the inscription from Ehrenberg-Jones. There is no vocabulary included. Rex Wallace's entry into the field is superior in several ways to the two editions (Benario and Damon) intended expressly for Latin students. One section of the eleven-page Introduction (pp. xi-xxii) provides the usual information about versions, date, and format, together with a paragraph-by-paragraph outline of content and a cautionary discussion of the propagandistic slants of the inscription. Another section, on 'Orthography and Grammar', will be especially useful to language students, who are alerted to, for example, variation between double and single consonants and between -i and -e in third declension ablatives, to the use of - um for -orum, and of fuisse for esse in the perfect passive infinitive. Under 'Syntax' (pp. xixf. ), Wallace describes peculiar subordinate-clause word order and the function of connecting relatives. Other specific matters of spelling and syntax (e.g., of numerals in sections 15ff.) are addressed ad loc. in the commentary. Concluding the introduction, a bibliography lists essential books under the headings 'Res Gestae', 'Augustus and His Age', and 'Architecture, Art, Literature' (p. xxif.). Wallace adopts the BudÃ© edition text of Jean GagÃ©[] after regularizing punctuation and (like Benario) adding macrons over long vowels. Unlike the other editions mentioned here, he prints his notes along with the text on facing pages. The commentary combines the strengths of other editions: as regards historical information, it is less thorough than Brunt-Moore's, but comparable to Benario's or Damon's; as regards grammar and syntax, it is at least as helpful as the other language-student editions, but gives far more vocabulary assistance. Indeed, virtually every word is glossed in the notes at its first appearance besides being included in the Vocabulary at the end of the volume. Perhaps the best way to indicate the level of assistance provided by Wallace as compared with Benario and Damon is to take a core sample from each: I will focus on section 4, which details some of the emperor's public honors and offices. Benario glosses or comments on twelve words or phrases, mostly explicating historical references (dates, campaigns, persons) and technical meanings (ovation vs. curule triumph, auspices, tribunician power, etc.). Seven of the notes include very brief syntactic or lexical clarifications (the presence of distributive adverbs, dative with a compound verb, the force of per legatos as instrumental in contrast to an ablative of agent, etc.). Damon elucidates seventeen words or phrases, giving about equal attention to historical details and points of grammar or syntax. She is more concerned than Benario to meet the needs of the Latin student, often offering outright translations (e.g., of quibus omnibus supersedi, quoque bello, solutis, liberi), morphological help (noting auspicis for auspiciis and fuere for fuerunt), and identification of potentially confusing or unfamiliar syntax (e.g., ablative of time within which, impersonal perfect passive). The longest notes are devoted to curule triumphs, the title imperator, the force of epistolary tenses (fueram ... scribebam ... eram), and tribunicia potestas. Wallace annotates thirty-nine words and phrases; in five cases (curulis, triumphus, auspicium, supplico, tribunicius) the same word is glossed twice: first for lexical meaning, then for significance in context. Eighteen notes reproduce entries in the Vocabulary pages at the back of the book. Morphological and syntactic matters are addressed in six notes. As in Benario's edition, the longest entries are on curule triumphs and tribunician power. Following the text and commentary are a photograph of the Temple of Augustus and Roma, Ankara; a line drawing of the plan of the temple, showing the location of the Latin and Greek inscriptions; three detail-photographs of portions of the Latin inscription; and maps of the Roman empire, the city of Rome, and the Capitolium and imperial fora. Next there is an index of place names and persons and finally the vocabulary. Wallace's addition to the available student editions of the Res Gestae offers historical and grammatical/syntactic annotation sufficient to the needs of an intermediate-level student and quite comparable to that in Benario and Damon. The lexical assistance, however, is fuller--much fuller--than in any competing work. These features--together with the volume's excellent introduction, maps, and illustrations--make it the best option in a field of fine choices for classroom use. NOTES [] P.A. Brunt and J.M. Moore (edd. ), Res Gestae Divi Augusti (Oxford 1967); Herbert W. Benario (ed. ), Caesaris Augusti Res Gestae et Fragmenta (Detroit 1990, first edition Robert S. Rogers et al. [edd. ], [Boston 1935]); Cynthia Damon, Res Gestae Divi Augusti (Bryn Mawr 1995). [] V. Ehrenberg & A.H.M. Jones, Res Gestae Divi Augusti, in Documents Illustrating the Reigns of Augustus and Tiberius (Oxford 1955) pp. 1- 31 (based on H. Volkmann's 1942 critical edition). [] Replacing that of C. Barini (Milan 1930) used in the first edition. [] J. GagÃ©, Res Gestae Divi Augusti (Paris 1977).